Lifestyles Skyn Condoms 3 Pack is the first premium condom made from polyisoprene, a scientifically formulated non-latex material that delivers the ultimate sensitivity that is the closest thing to wearing nothing. Polyisoprene material provides softer, more natural feel than latex. Clinically proven to enhance sensation. Combines the strength of premium latex with the sensitivity of an ultra thin condom for that Skyn-to-Skyn sensation. Ideal for people with latex allergies or latex sensitivity. Long-lasting, ultra smooth lubricant enhances the experience. A high quality alternative, Lifestyles Skyn are condoms that are made with a special polyisoprene material that transfers body heat well for more intimate sensations. Each lubricated condom is tested to ensure strength and durability, providing protection against STDs and pregnancy. Skyn condoms are completely latex free and a perfect choice for those with sensitivities, or a partner with allergies to latex. Type: Condoms Pack: 3 Special Features: Lubricated, Latex Free. 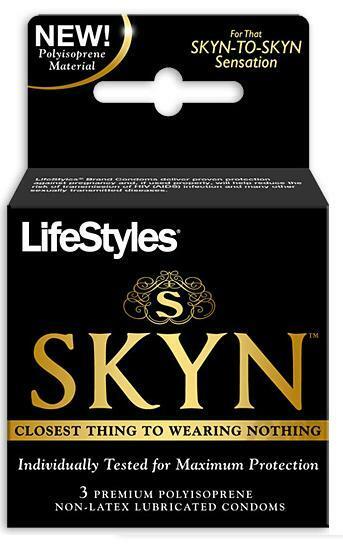 Lifestyles Skyn Condoms 3 Pack.